Below are horseshoe Christmas trees (ie, Christmas trees made from horseshoes) for sale on Amazon and eBay. There are also Christmas ornaments made from horseshoes. 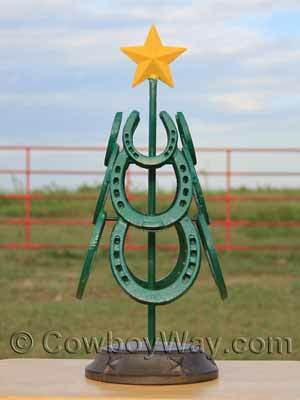 Below: A green horseshoe Christmas tree with a yellow star. We purchased this as an all-brown tree (like the base in the photo) but painted it after we bought it. How big (tall, wide, and/or deep) is the tree? If the Christmas tree is shown with other items such as ornaments, a star on top, etc., do those items come with the tree? Hint: Often not. Many sellers like to decorate their horseshoe Christmas trees to give you an idea of what they can look like with decorations, but often the decorations themselves aren't included. Make sure you know what you are, and are not, getting with your purchase. Is the Christmas tree already made and ready to ship, or will it be built after you place your order? If the Christmas tree will be built after you place your order, does it come in one color or can you choose a color? How long will it take for the seller to build it and ship it to you? Will the seller ship to your location? Is shipping included in the price or will it be extra? If extra, how much will it be? Does the seller accept returns? If so, what are the conditions for the return? Will their be a re-stocking fee?